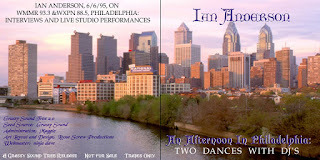 Ian Anderson-"An Afternoon In Philadelphia: Two Dances With DJ's"
Ian Anderson-"An Afternoon In Philadelphia: Two Dances With DJ's". 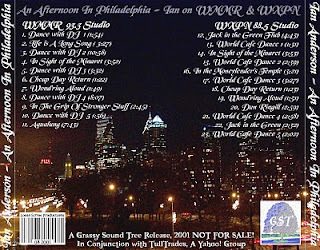 WMMR-FM & WXPN-FM Studios, Philadelphia, PA, USA 06-Jun-1995. (A Grassy Sound Tree Release 2001). Ian Anderson on WMMR 93.3 FM & WXPN 88.5 FM. Interviews & live studio performances promoting Ian's "Divinities" album. Band line up: Ian Anderson, Andy Giddings, Jon Noyce, Doane Perry, Chris Leslie.